My previous muesli bars have been very popular, so I thought I’d do a new version, and let’s be honest, cranberry and white chocolate are a match made in heaven. 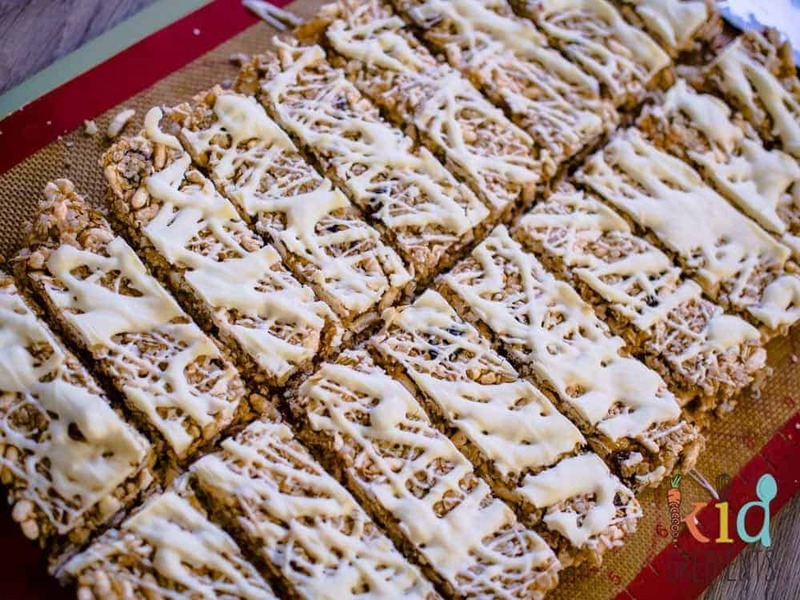 These sticky and chewy no bake cranberry and white chocolate muesli bars will hold up well in the lunchbox and can be cut into whatever size suits your lunchbox. If you want these to be dairy free, don’t drizzle with white chocolate because everything else about them is dairy free! If you don’t need them to be dairy free, feel free to sub the cacao butter (which can be exxy if you don’t buy it at aldi when they have it as a special) for the same amount of normal butter. They will turn out the same as they have with the cacao butter. 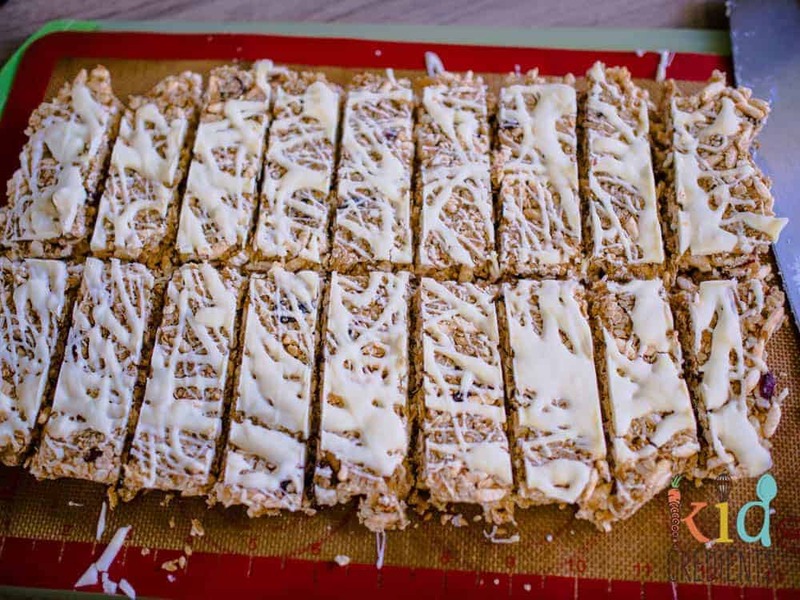 These scrummy bars are nut free because of school. If you prefer, you could switch out some of the coconut for flaked almonds if they aren’t going to a nut free environment. Don’t worry about how messy your drizzling might be on top of the bars, no-one will notice when they are cut anyway and to be honest the kids will like the extra chocolate. To get the drizzle like mine, use a fork and flick it a little over the top of the bars then refrigerate to set the chocolate before you cut them. Watch the insta videos that are in the first muesli bar post! I’ve had readers saying their bars haven’t worked out. The truth of the matter is: the mixture will look like it will not hold together. It will look like sticky cereal. BUT…that’s what means it will stick together! If it’s too wet…they will just be sloppy! Remember: the wet ingredients have a solid state…and refrigerating them, all pressed together…they will return to the solid state. Which means they will hold together, don’t add extra liquid because you think they won’t stick….it will just result in a porridgey mess! 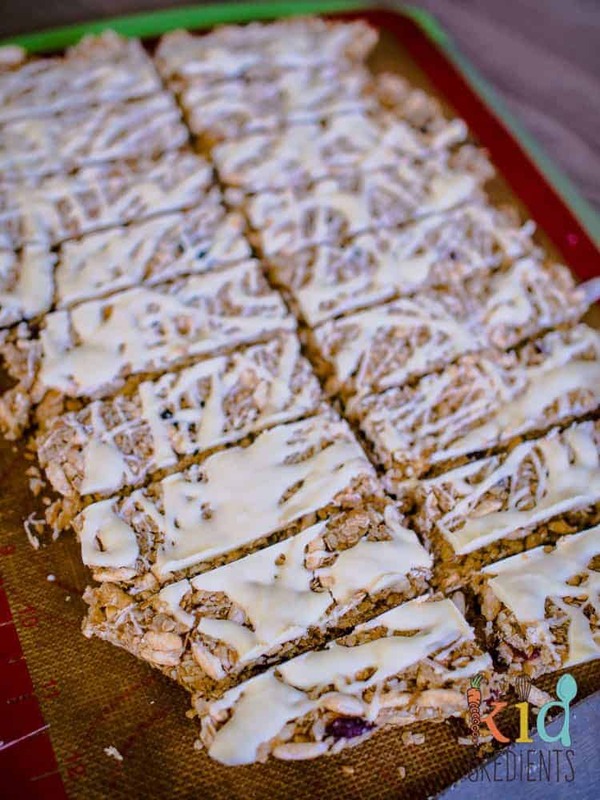 No bake cranberry and white chocolate muesli bars that are perfect for the lunchbox! Nut free, yummy and so chewy. No need to bake, simple to make. In a sauce pan, melt the cacao butter with the maple syrup and the coconut sugar. Bring to the boil, then allow to simmer for about 5 minutes, it will be thick and gloopy. Remove from the heat and stir through the vanilla. Add the oats, puffed rice, quinoa flakes, desiccated coconut, dried cranberries and flax seeds to the hot mixture and mix well. Line a baking dish (mine was about 22cms by 33cms) with either: a double layer of baking paper or a silicone mat. Press the mixture down well into the baking dish. Remove from the fridge. Mix the melted white chocolate with the coconut oil until all the coconut oil is dissolved through. Using a fork, flick the white chocolate over the top of the bars return to the fridge for 10 minutes before cutting. 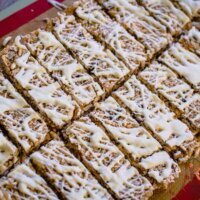 Remove from the baking dish and slice into bars. I got 20 yumbox sized ones from this batch. 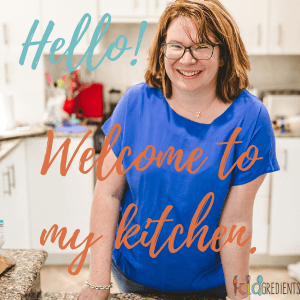 Store in the fridge in a sealed container with baking paper in between the layers. I stuck with the ratio of wet ingredients but still nice I cut it into bars it fell apart and was really crumbly. I used regular caster sugar is this the problem? Possibly, did you get the wet mixture really thick and gloopy? These look delicious – I think that they would go down a treat with my boys.